If you own an antique motorcycle or always wanted too I’m sure you are familiar with “Concours d’Elegance” type events. Similar to the high-end showcase for automobiles at Pebble Beach or auctions at Bonhams the Legend of the Motorcycle is a world-class concours exclusively for motorcycles. Held a couple weeks ago the annual event was on the lawns of the Ritz-Carlton in Half Moon Bay, CA and contained more than 150 of the best pre-1978 motorcycles from around the world. These historic motorcycles were showcased and judged. They were all there from Norton’s, Vincent’s, Excelsior, Harley, Crocker & Brough Superior including bikes from custom builders Jesse James, Shinya Kimura, Paul Cox, Roger Goldammer and Billy Lane. Also on display were memorabilia from artworks, to racing photos and antique advertising as well as Steve McQueen’s 1940 Indian Scout. Did You See that Motorcycle? With warmer spring weather in the NW comes the motorcycles. And with motorcycles come the accidents. Regardless of who is at fault, the motorcyclists seldom fare well. Simply put, a lot of drivers DO NOT see motorcycles or the motorcyclist. Yeah, some of those drivers are talking on their cell phone or enjoying a two-all-beef-patty Big Mac behind the wheel, but some pay attention and still don’t see motorcycles. We’re not invisible, but every experienced motorcyclist understands that many drivers don’t see us and rides accordingly. I think we all try and remain outside of any blind spot, and give ourselves enough cushion to make an emergency maneuver – bottom line is that motorcyclists think about accidents all the time. And they think about how to avoid them. I remember a trip to Reno a few years ago where on an isolated stretch of Highway 31 between LaPine and Silver Lake it was after dusk and difficult to see. The posse slowed below the 55MPH speed limit in anticipation of darting deer, but out of no where we came up on a large brick sized casing in our tire path. A couple of us had the thing bounce off the bike frames after the lead rider basically ran over it. At the wrong angle this could have tossed a rider off before they could do anything. A car driver would have just gritted their teeth and hit the object. Whatever happens to their car, the impact will probably leave the car driver unscathed, but it could leave a motorcyclist seriously injured. We were fortunate to only have some damage to the bikes. It turned out to be part of an old Chevy Truck transmission which had broke down about 10miles ahead of us…duh, no wonder. So why do people ride? That’s an interesting question. Many bikers would scoff and tell you that if we had to explain it to you, you wouldn’t understand. Much of that is true, but let me try to give you some additional insight. Many riders began riding motorcycles in their youth and now they are returning to the hobby. They’ve worked hard all their lives, maybe raised a family and now it’s time to enjoy something they have not enjoyed in years. Some of these riders even include significant others or their spouse in their hobby. You’ll see them heading down the highway loaded down and equipped with everything from tent trailers to a CB radio to XM satellite players cranking out “Born To Be Wild”. Or maybe you’ll see someone on a Harley looking like they need a cup of coffee as they find America and are experiencing it the adventures way. Or they are sport bike riders dressed in multi-color leather suits and bent over their bikes looking fast sitting still. No matter how we’re dressed, or whatever we ride, we all share one thing in common: we want to get home alive that night. So give us a break. Keep your eyes wide open on us! When you see us look and then look again for us when you don’t. Because we’re out there and we’re looking at you. A bit of nostalgia on this rain/snow mixed day. After WWII the allies engaged in a scramble to pinch Nazi Germany’s technology and this included motorcycles. The Harley “Hummer” (Model 125) design was an adaptation of the German DKW motorcycles whose engineering designs were forfeited to the Allies as a part of War Reparations. The simple DKW 125cc was reproduced as the British BSA Bantam, the “Hummer”, the Russian Moskva M1-A and the Yamaha YA-1 in Japan. The Hummer was added to Harley-Davidson’s model line in 1948. The “Hummer” is the unofficial nomenclature as its official listing is the American Lightweight and referenced that way in the Enthusiast Magazine. The Hummer was a stripped-down basic model using a redesigned “B-model” engine with the old 125 cc capacity. It was named after Dean Hummer, a Harley dealer in Omaha, Nebraska Omaha, who led national Harley two-stroke sales. The Hummer was as basic as it could have been, and was sold without battery, electric horn, turn signals, or brake lights. However, one company went on to innovate the DKW 125. IMME (a German word for bee and the tank logo) was made in Immenstadt in Bavaria from 1949-51. The Imme’s list of innovation is impressive in today’s standards let alone in the 50’s. It had a single sided front fork, a rear swing-arm which doubled as exhaust, rear monoshock, and quick release wheels that leave chain and sprocket in place and a twist grip 3-speed gear box. The designer was Norbert Riedel whose claim to fame was designing 2-stroke motors to jump start German jet fighters. 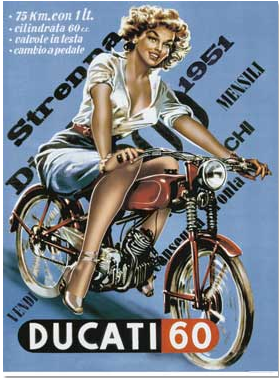 Production started in 1949, but only 80 motorcycles were made the first year. Production numbers reached 400 a month later, and in 1950 up to 1000 a month. The bikes could be sold, but some financial (and warranty) problems occurred and the IMME AG went out of business. Riedel had designed a new egg-shaped twin 150cc engine and planned a comeback with an improved version of the IMME and a 150cc scooter, but in 1951 the factory was shut down again. Later Norbert Riedel worked for Triumph in Nürnberg and Victoria. He died in 1963 in an avalanche accident. Photo courtesy of Harley Hummer Club.